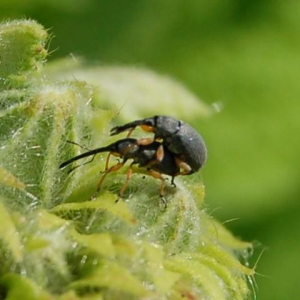 This weevil is very small but quite distinctive, with yellow legs and a very long snout. It was found to be breeding in the UK for the first time in 2006, in London, and a few days after that I found the second UK colony in my garden in Bucks. The colony persisted in 2007 but couldn't find it at all in 2008. It feeds on Hollyhock.